Imagine my horror when I was going through the 200 odd photos I had taken of the boat and came across this one of the top of the mast. Look closely at the clevis pin holding the back-stay in place. Notice that there is a cotter pin or split ring missing from the pin. That means that the mast is being held up by a prayer. The topping lift is helping but the main sheet is quite loose and wouldn't be enough to hold the mast. 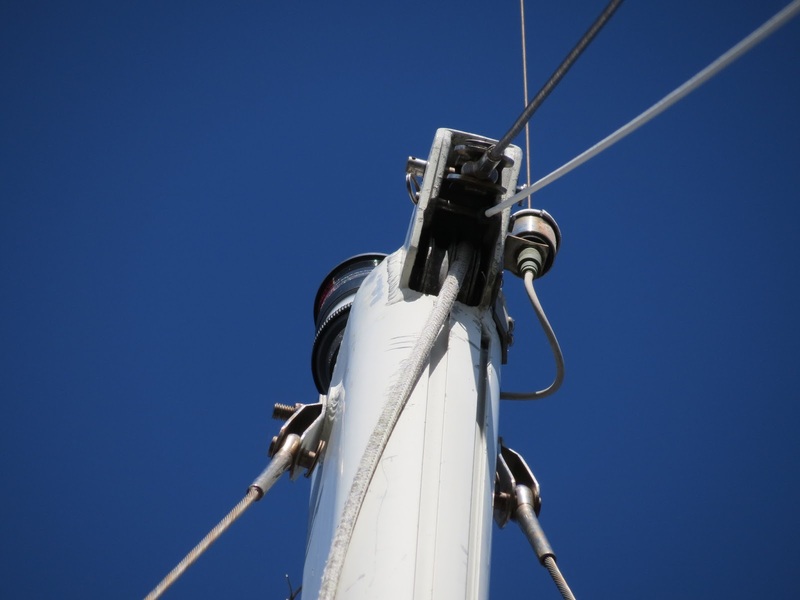 Because the bowsprit is broken and there is no fore-stay attached to the bow, I tied the main halyard to the stanchions. I am running out of options because the spinnaker sheet is missing too. I will need to tighten down the main sheet and swap the main halyard to the boomkin.